Nick Redfern works full-time as an author, lecturer, and journalist. 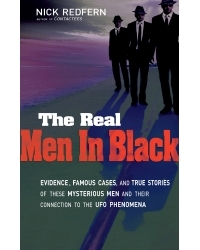 He writes about a wide range of unsolved mysteries, including Bigfoot, UFOs, the Loch Ness Monster, alien encounters, and government conspiracies. He writes regularly for UFO Magazine, Fate, Fortean Times, and Paranormal Magazine. His previous books include The NASA Conspiracies, Contactees, and Memoirs of a Monster Hunter, all published by New Page Books. Nick has appeared on numerous television shows, including the BBC’s Out of this World; History Channel’s Monster Quest and UFO Hunters; National Geographic Channel’s Paranatural; and SyFy Channel’s Proof Positive. He lives in Arlington, Texas and can be found online at www.nickredfern.com.